The self-acting incline at Kilmersdon Colliery, near Radstock in Somerset, is the last survivor of many in the Somerset Coalfield. The writer's research into the colliery history of this area is as yet in rather an embryonic stage but it would seem that, apart from Kilmersdon, only Wells Way and Clandown Colliery had standard gauge inclines, unless the second incline at Lower Conygre Colliery (replacing the original harrow gauge one was also standard gauge. There were however at least six other narrow gauge inclines at various collieries and perhaps more have gone unrecorded. The Kilmersdon incline and tramway were constructed in 1877, the incline being double track and 160 yards long. The overall gradient is 1 in 4, there being a steepening about two-thirds of the way down. The winding drum, supplied by the Somerset Engineering & Wagon Company is housed in a small stone building at the head of the incline between the tracks. 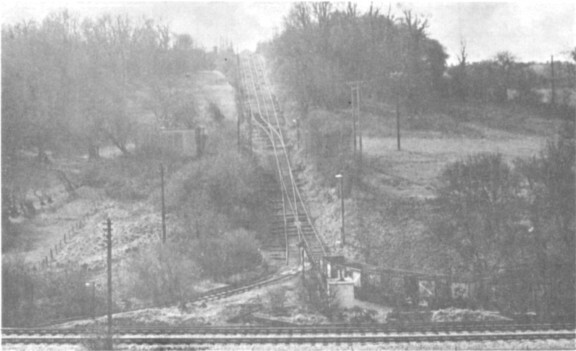 The incline originally had only one connection, the southern, to the Bristol-Frome line (Great Western Railway). 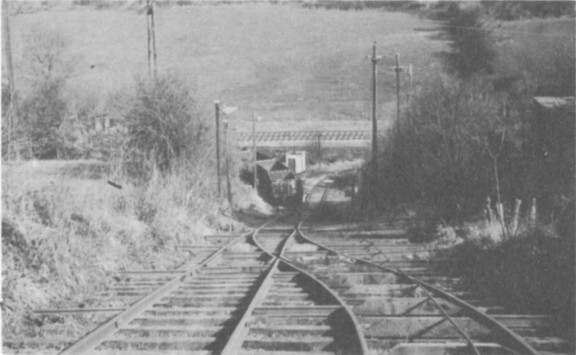 In about 1900 sidings were laid at the head of the incline so that colliery dirt could be tipped oh either side, whilst the track oh the lower part of the incline was singled and a point inserted. The northern side of the triangle was completed, and henceforth empty wagons were kept here to await hauling up. Full wagons were then run into the southern siding until picked up by the GWR locomotive. An interesting point about the northern curve is that the check rail (both curves are very small radius is oh the outside of the outer running rail. Today, the incline is laid with flat-bottom rail, as opposed to that oh the rest of the tramway which is chaired bullhead. Rail joints are often welded, and the rails either spiked direct to the sleepers or welded to the soleplates which are then spiked to the sleepers instead. The track is held in position with baulks of timber against the sides of the cutting. Lengths of old rail are also used, these often being welded to the running rails. The incline is worked as follows. One of the colliery locomotives brings one or two full wagons to the top of the incline. Chocks across the rails prevent a wagon being shunted over. When an empty has been attached to the cable at the bottom, the full wagon is run down, bringing up the empty as it goes. The descent is controlled by the locomotive fireman, who operates a pair of drum brake levers in front of the drum house. There is also a lever for the catch points half way down, which can be used in an emergency. As the empty comes over the top, the chocks are swung across behind it, the cable is unhooked and the locomotive shunts the wagon into the siding. When five or six wagons have been brought up, they are all taken back to the colliery for loading. Above - Two views of the incline, 19th March 1966. Most inclines have their tales of runaways and Kilmersdon is no exception. The photograph (above) shows the most destructive which is believed to have occurred in the mid-1950's. The little Ruston diesel was unable to control the wagons it was shunting, and was pulled over the top, the driver luckily jumping clear. The wagons were badly damaged, nor was the diesel unscathed. To clear away the debris, a wagon was lowered on the other track and bits of wagon and coal loaded into it. 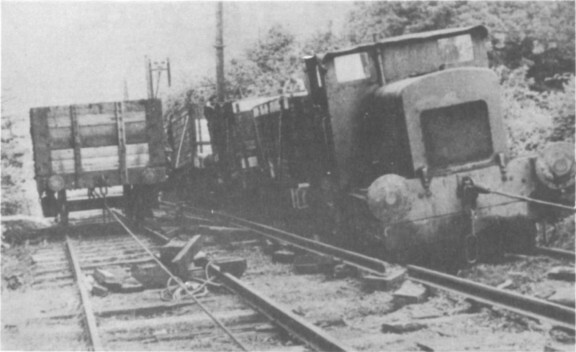 The resultant load was sufficient to lift the diesel back to the top, when it was relegated to a siding in disgrace. It is this need for braking power that caused the decision to keep the Hunslet from Norton Hill out of use until new brake blocks were ordered and fitted. The cable used on the incline seems to last a fair length of time, one fitted in May 1950 not being taken out until June 1963. One hopes that the colliery will survive for the cable to be replaced yet again. To conclude, I wish to thank Mr H. Loader for his very kind help in the preparation of this article. "The Argentine Republic has been unable to pay the contractor, Herr G. Luther, of Brunswick (Germany), who supplied the steam cranes, pumps, locomotives, harbour railways, &c., which were used in connection with the construction and fitting out of a port at La Plata, and has instead offered to hand over the management of the new works to the German firm, so that the latter may make good its claim out of the receipts. The offer has been accepted." ("Iron", 28th August 1891.